New Delhi, April 7: India’ Prime Minister Narendra Modi has launched a US$ 1.5 billion World Bank aided program to clean up India and end open defecation. But the ambitious project is only partial success as many obvious flaws have not been attended to, writes P.K.Balachandaran in DailyFT. 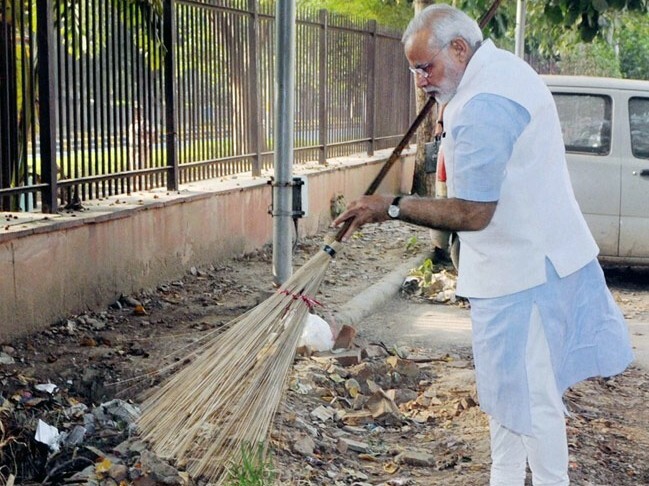 Since open defecation has been an eyesore and a major cause of diseases in India, the Narendra Modi Government launched a ‘Clean India’ campaign named Swachch Bharat Mission (SBM) on 2 October 2014, four months after he came to power. The day, 2 October 2014, happened to be the 145th birth anniversary of the ‘Father of the Nation,’ Mahatma Gandhi, who was also the country’s first campaigner for a ‘Clean India’ with a special emphasis on building and maintaining hygienic latrines to end the degrading practice of open defecation. In fact Gandhi deliberately lived in the Bhangi Colony or Sanitary Workers’ Colony in Imperial Delhi to turn it into a clean place where everybody, including himself, would keep the environment, including the toilets, clean. Prime Minister Narendra Modi had given the Swachch Bharat Mission the task of ending open defecation by 2 October 2019, to mark the 150th birth anniversary of Mahatma Gandhi and also the completion of his five-year term of office. Inspired by Modi’s initiative, Bollywood actor and director Akshay Kumar made a film in 2017 entitled ‘Toilet: Ek Prem Katha,’ which earned INR 1.3 billion in the box office. The film featured a ‘Toilet Anthem’ sung by Khiladi Kumar. “The intention to create this song was to make people realise the importance of having toilets in their homes. I want everyone to educate their kids so that they can grow up and bring this big change,” Akshay said. The aim of the Swachch Bharat Mission was to build almost 65,082 lakh toilets by 2019. A $ 1.5 billion World Bank loan, to be repaid over 18 years with a five-year grace period, was taken for what was legitimately dubbed as the “largest cleaning campaign in the world”. The World Bank would disburse the funds in tranches upon the submission of a report by an independent evaluation agency. SBM was by no means a totally new project. The predecessor United Progressive Alliance (UPA) Government led by Dr. Manmohan Singh had its own Nirmal Bharat Abhiyan (Clean India Expedition) running, and had some achievements to its credit. But Modi changed the name and gave the movement a new thrust and a new sense of urgency. The primary aim of both the NBA and the SBM was to eradicate open defecation, establish a system of door to door waste collection, and construct toilets in every household and in public places. Considering the vast difference in the sanitation requirements between cities and villages, the SBM was divided into SBM (Urban) and SBM (Gramin or Rural). The former is under the aegis of the Ministry of Housing and Urban Affairs while the latter is handled by the Ministry of Drinking Water and Sanitation. The SBM also envisages the creation of awareness about sanitation and health and improving the quality of life in rural areas by promoting hygiene and cleanliness. The SBM could obtain loans from the Government for setting up rural sanitary marts and to receive funding for constructing community sanitary complexes and setting-up solid and liquid waste management projects. As per Government figures, sanitation coverage in rural areas was 42.01% at the time of the launch of the SBM in October, 2014. This increased by over 15% in the next couple of years and stood at 58.75% at the end of 2016. Meanwhile, 130,000 villages had been declared ‘Open Defecation Free’ by 2016 end. By October 2019, 65,082 lakh toilets are to be constructed. By the end of 2017, 3,851 lakh toilets had been constructed, achieving 58.5% of the target. However, the achievement was uneven in the country as a whole, with success varying from state to state. Andhra Pradesh led by the progressive Chief Minister Chandrababu Naidu, showed an achievement rate of 172% and Prime Minister Modi’s State of Gujarat was next with 137%. The tribal State of Jharkhand registered 114%. But Delhi State, where the national capital is located, and Meghalaya, Tripura and Assam in Eastern India achieved less than 1%. Progress in the construction of community or public toilets was less. Only 44% of the target of building 500,000 public toilets was achieved. However, 1,100 towns and cities across India were declared Open Defecation Free. Garbage collection from house to house showed 50% success. Door-to-door collection was introduced in 41,000 of the 81,000 municipal wards targeted. Municipal waste processing improved from 16% in 2014 to 22% in 2017. Waste segregated in individual households is collected by garbage trucks and taken to a secondary segregation centre, from where it is transported for processing and treatment. As per Government data, almost 1.65 lakh tons of compost was produced in 2016, with the current waste-to-energy production level being 88.4 megawatts. But the country has a long way to go in waste disposal. Even big cities like Delhi still have mountains of unprocessed garbage. The SBM is not just a Government program. Private and public companies have been roped into it. Toilet construction in schools, ‘Swachch Vidyalaya Program,’ is part of corporate social responsibility programs. However, the SBM has its critics too. There is no dispute over the need for such a mission, but its claims, approach and implementation have come under fire. While the Modi Government claims stupendous success, the funding agency, World Bank, in its report dated 5 February 2017, said that the SBM’s achievements were “moderately unsatisfactory”. The World Bank had delayed its tranches on the grounds that the Government had not submitted evaluation reports by an independent third party agency as per the undertaking. According to the National Family Health Survey Series 4, only 48% of the households in India are using improved sanitation facilities. In the rural areas, only 36.7% of the toilets unconstructed are actually used as toilets. In other words, peopled defecate in the open outside, even if they have built a toilet in their homes. Only 29% of the households in the ‘Achievement List’ had actually constructed toilets. There is corruption as in other Government-funded schemes. According to a survey, only 24% of households which had constructed toilets in their premises had received dues from the Government under SBM. According to a review conducted after the first year of the SBM, public sector undertakings had only achieved 11% of their target. The private corporate sector, on the other hand, performed even more poorly meeting only 8% of its target, having built just 424 toilets. A major hurdle in the way of the SBM is the scarcity of water. Public toilets in metropolitan cities have been reported to have no water supply at all. Non-availability of water in many parts of rural India makes people avoid a household or a public toilet and opt for open defecation instead. In the open, nature takes care of the disposal of bodily waste. “This leads one to question whether building toilets serves any purpose in the absence of water supply,” as one observer put it. Therefore the Government has to ensure water supply first. The other problem is created by the Government’s methods of enforcement. According to a report, in certain villages in Rajasthan, the local authorities had instructed ration shops not to issue dry rations to households which had not built toilets. But this could be mean starvation in the case of poor agricultural labourers belonging to the lowest Dalit caste. Poor disbursement of funds by the Government is another inhibiting factor. A household needs INR 20,000 to 30,000 to build a sanitary pit for a toilet. But the poor, who are the majority, cannot afford to pay this from their own pocket. Therefore, toilets are either not built at all, or only built partly.